We started the session with Q & A session in which participants raised questions about Volumes, Security and Docker in Production. After a round of introduction we started sessions. I gave the first session on storage backends for Docker. I extended my tutorial which I gave at LinuxCon EU last month, so that participants can try it later on as well. 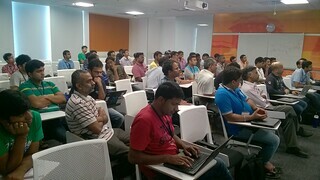 After my session Debashish Saha talked about Docker Volume. 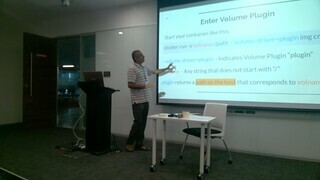 After that Moorthy RS gave excellent talk on Docker Volume plugin. He showed with an SSHFS example, which was really helpful. At last Vaibhav and KG from VMware talked about Photon, which minimal container OS like Project Atomic and CoreOS. They also gave overview of VMware Appcatalyst , which VMware is promoting as Desktop Hypervisor for Developers. Currently it is available for Mac OS only. Once the session were, we took suggestions for topics for next Meetup, which we’ll schedule at this month end or first week of Dec.